Today I feel like a young child, eager for Show and Tell to start, bursting with impatience for my turn to display my item and tell you all about it. 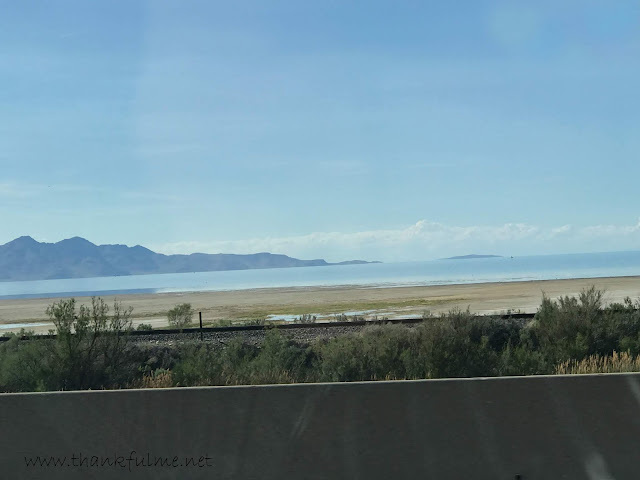 I missed participating in the Ten Things of Thankful blog hop last week, and anticipate missing a few in the upcoming weeks, which means, if we were actually in an elementary school classroom, I would now be the child sitting on the edge of my seat, furiously waving my arm in the air and shouting, "Pick me! Pick me!" You see, even on weeks when I am absent, I'm still thankful. Even when I don't blog frequently, I still think about what I would share if I did sit down and write. I have posts percolating in my brain, and one of these days, I will once again be a more productive writer and reader of blogs. In the meantime, I'm thankful for my turn to reflect on recent weeks and share with you the beauty I've observed. 1. I'm thankful that decades ago, the previous owners of the house we are renting planted a wisteria vine. I have really enjoyed this massive plant and its gorgeous, fragrant blossoms. 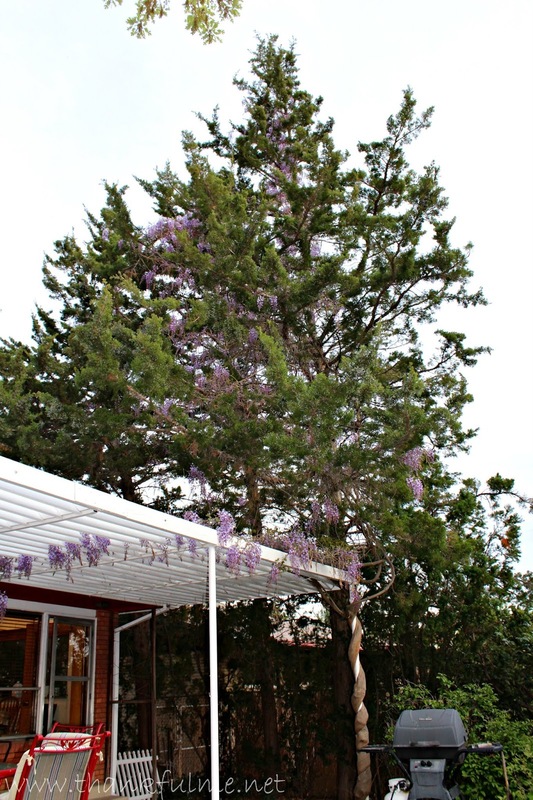 Photo: A thick wisteria trunk is wrapped around a support pole of the patio roof, and the wisteria vines climb to the very top of an evergreen tree that towers above the house. The evergreen tree is covered in purple wisteria blossoms. 2. I'm thankful that the house we bought (and will be settling into in the next couple of months!) also had previous owners who took the time to plant flowers. I enjoy the discovery of seeing the various varieties bloom. Photo: A bed of bearded irises. 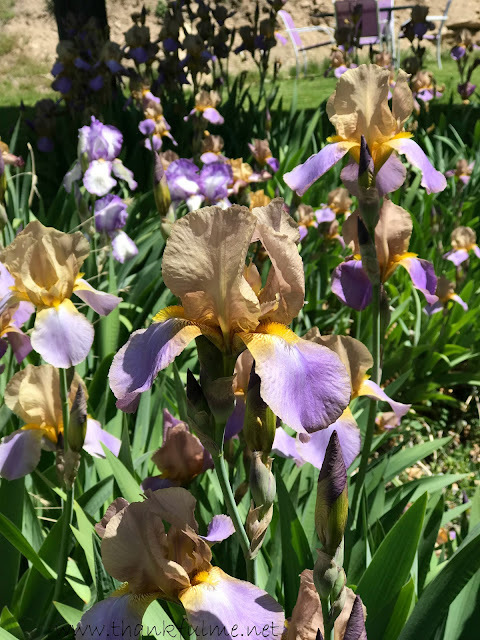 Each flower displays shades of purple, yellow, and white. 3. I'm thankful for good-hearted people. My neighbor who lived across the street from us when we lived in our previous house called me recently. She asked if she could give my current address to the new owners of our past home, as they had received some of our mail and wanted to make sure we got it. I told her yes, but soon forgot about the conversation. A few days ago, the doorbell rang, and when I answered it, a man introduced himself and said he had some mail for John. I thanked him, took the envelopes, shut the door, and belatedly processed what he had just said. He was the man who bought our house in California, and he showed up on our doorstep in Utah to deliver our mail?! I quickly opened the door, but he had already left. I called my neighbor and explained what had just happened, so she could apologize for my matter-of-fact "thanks" and offer a more heartfelt "thanks" on our behalf. Apparently he happened to have a business trip here, and decided to just bring us the mail. When I gave the OK to give him our address, I fully expected the mail would be put in a big envelope and delivered by the US Postal Service, not hand-delivered by the man who bought our home! 5. I'm thankful that we are strong and healthy. 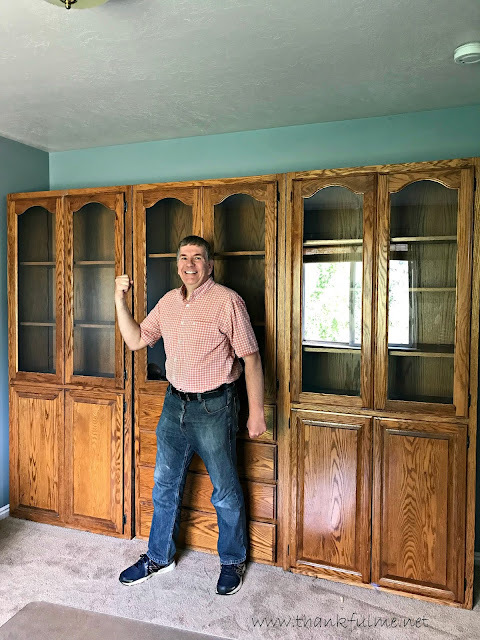 Yesterday, we were not only able to move a bed upstairs, the two of us managed to move John's three big, heavy, awkward bookcases upstairs to his office. Where there's a will, there's a way. 6. I'm thankful for whimsical, touching art. 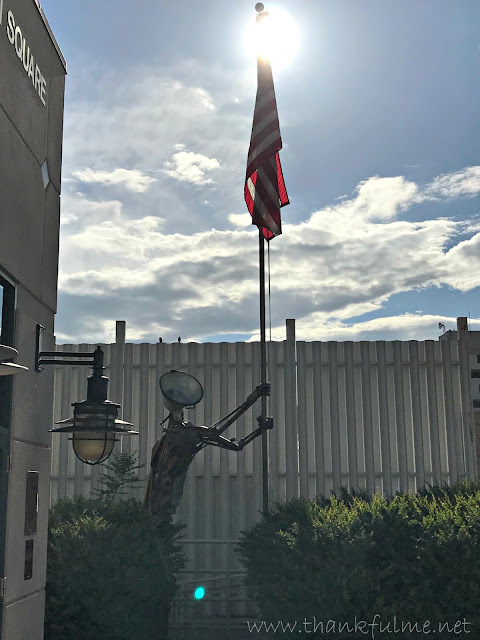 While John and I were walking around town the other day, we stumbled across this sculpture which appeared to be holding up the flagpole. Photo: Metal pieces form the shape of a man who is gripping a flagpole and looking up. 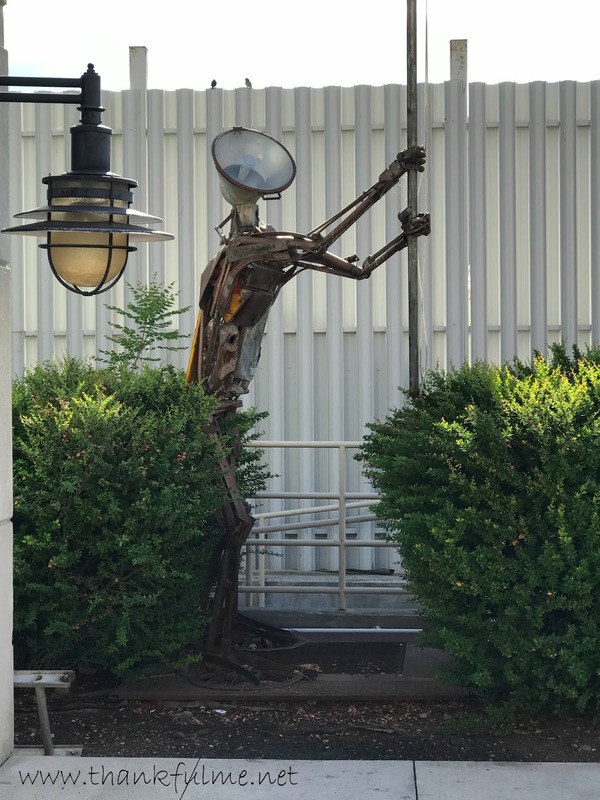 His head is made of a light, similar to the Pixar light. Photo: The same sculpture as above, but the entire flagpole is visible in this shot. The sun is directly behind the top of the flag. 7. 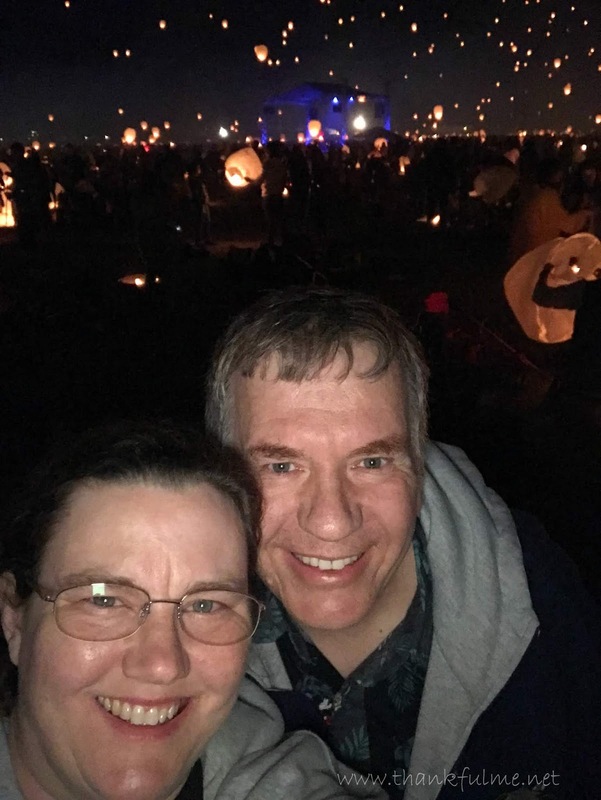 I'm thankful for the chance John and I had to attend a lanternfest last night. I stumbled across tickets on Groupon a couple of months ago and thought the event sounded interesting. It was absolutely beautiful! If you ever get a chance to attend one, I would highly recommend it--and check Groupon to look for discounted tickets. In the meantime, let me recap the evening for you in photos and video. 8. 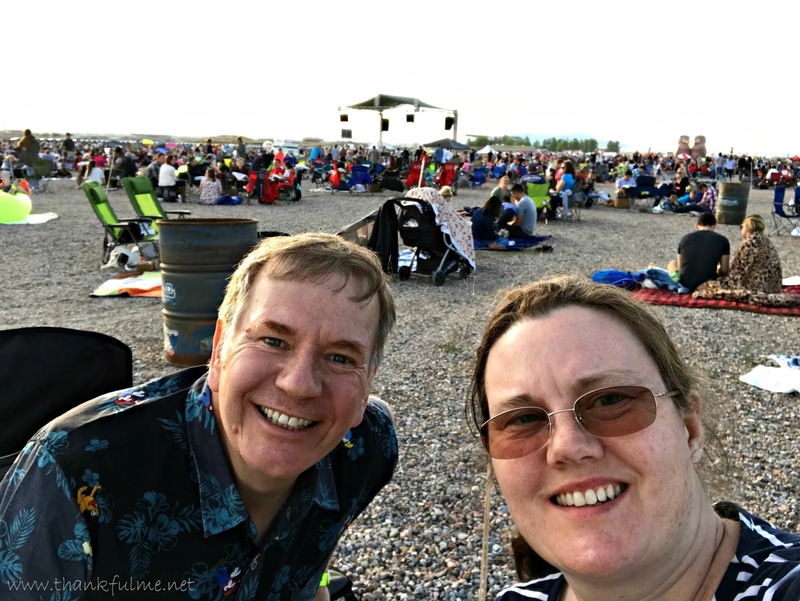 I'm thankful the earlier-predicted thunderstorms stayed at bay, and with the exception of a few clouds, the night was clear and the event could go on. 9. I'm thankful for interesting sights on the way there, and awe-inspiring sights at the event itself. 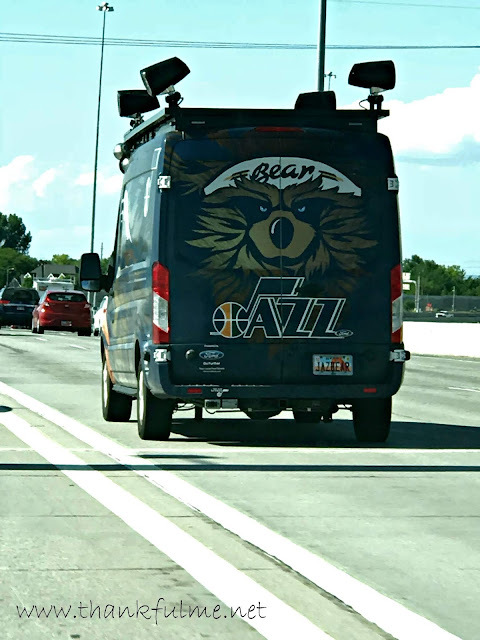 Photo: A tall van, with a painting of the Utah Jazz logo and a bear on the back doors, drives up the freeway. I couldn't see if the mascot was inside or not. Photo: A view of the Great Salt Lake, as taken from the car on the way to the lanternfest. When we arrived at the event, we joined with thousands of other festival-goers. Before it got dark, we staked out a spot around a fire pit, decorated our lanterns, visited food booths, roasted marshmallows and made some s'mores. Photo: John and I take a selfie, with thousands of other festival attendees in the background. 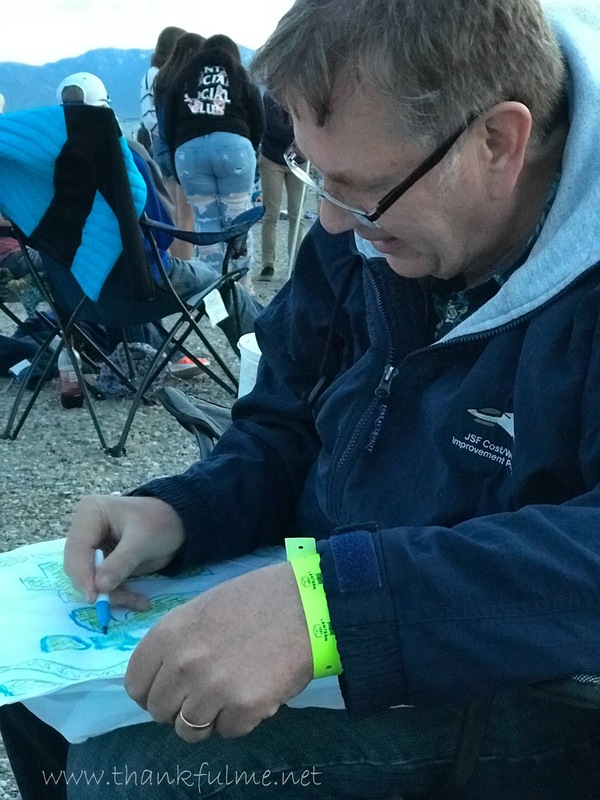 Photo: John decorates his lantern by writing "John" on one side, and "Kristi" on the other. Once it got dark, the magic began! 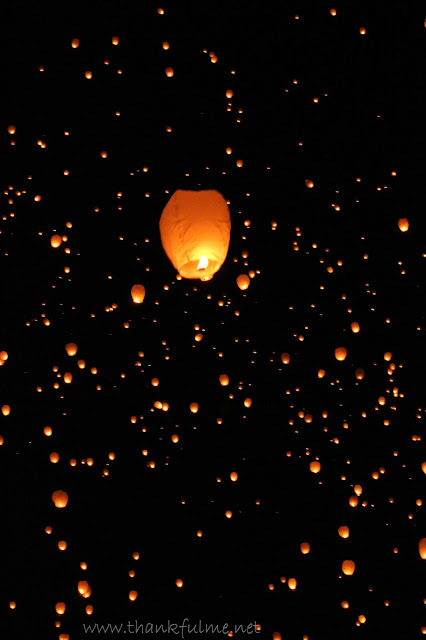 Everyone lighted their lanterns, and the glowing paper hot air balloons slowly ascended into the night. 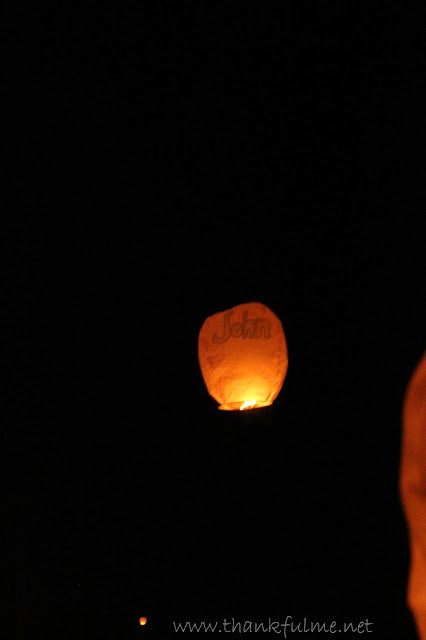 Photo: John's lantern--I know it's his because his name is clearly marked on it--floats into the night sky. Photo: The black sky is illuminated with glowing lanterns. 10. I'm thankful for John, and the wonderful times we spend together. Photo: John and I take a selfie at the LanternFest, as glowing lanterns dot the night sky behind us. 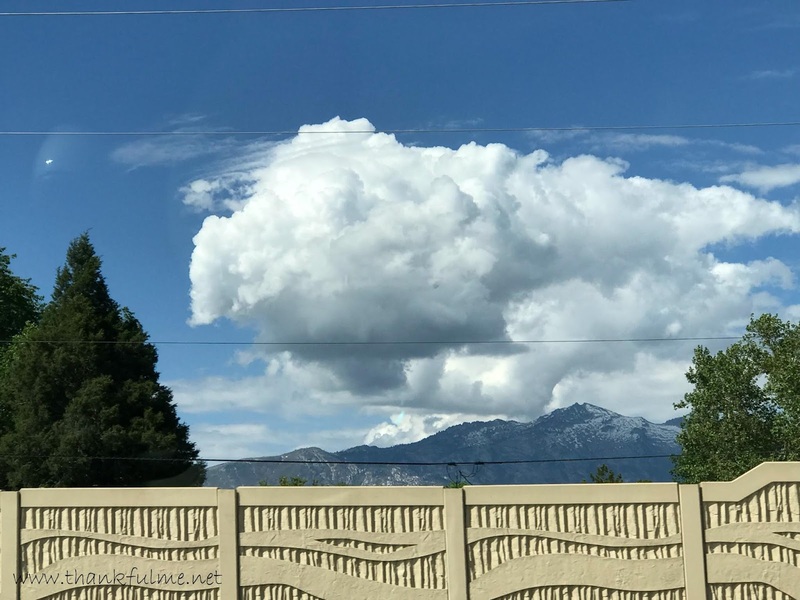 What beautiful things have you noticed lately? What are you thankful for this week? Leave a comment and feel free to link up your own post! Our rental contract goes for a couple more months, then we will be all moved into our own place. Looking forward to it! Surprise flowers can be fun, we're waiting to see if the lone thistle we had show up in the middle of the backyard returns this year, scary leaves, attractive flowers. The festival took place in a gravel parking lot. It was very well-organized, with ample fire extinguishers throughout, and emergency crews on hand in case of fire. Your comment about the thistle reminds me of the time my oldest daughter asked me why God put dandelion flowers on weeds. Wow! What a really cool thing! Beautiful! 3D sky fire lol. Excellent. Here, here to touching whimsical art!! The lanternfest was absolutely amazing. The wisteria is here at the house we are renting, but the irises are at the house we bought and are moving into. I know it is a luxury for us to be able to move in gradually. Moving is a big project, and especially stressful when it happens suddenly. Whoa! 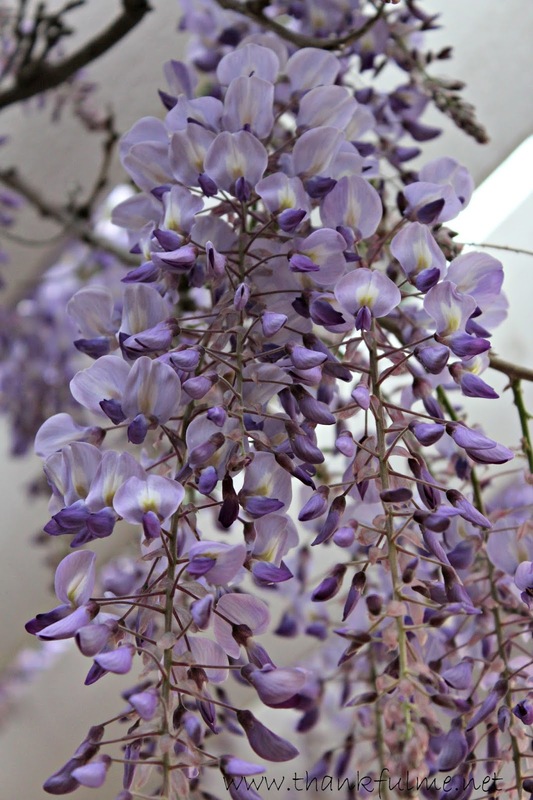 The wisteria is seriously healthy and beautiful. Congratulations on hefting he bookcases up a tricky staircase without marring the walls. Love the lantern photos. Isn't that wisteria amazing? I will miss it when we move out of this rental house. Incredible. All of it. The wisteria, the staircase, and especially the Lanternfest. Happy times and beautiful places! Thank you for sharing them with us. Your TTOT is like Christmas in May! A garland of wisteria wrapped around the evergreen tree and the sky lit up with beautiful colorful lights, and you two with your glowing smiling faces. Thanks for sharing the video too. I've never seen wisteria in real life, and your photos of it are amazing hanging there so beautiful. I love all shades of purple flowers. :-) I can imagine how fun it is to see what surprises appear in the yard at the new house too! Hauling heavy furniture is no fun at all. 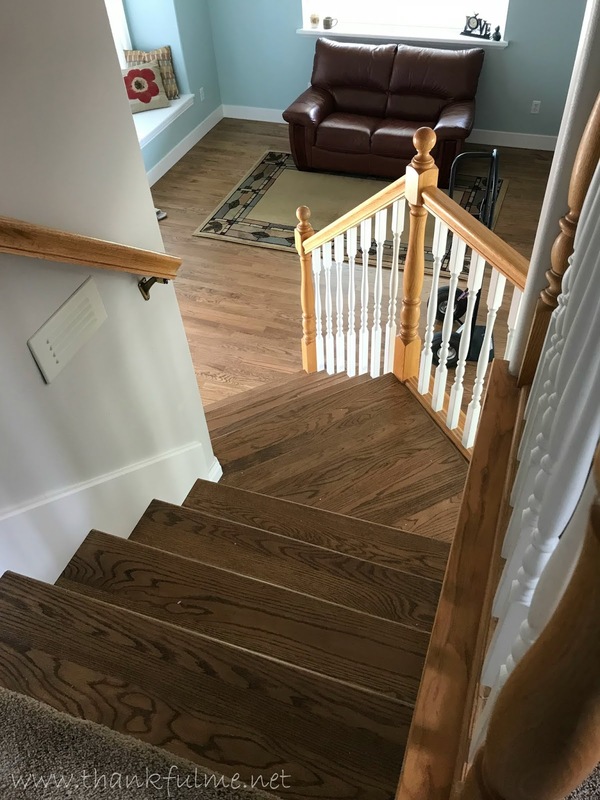 It is a testament to you and John being in good shape to get those things up the curvy stairway and into place. Can't wait to see the whole house tour when you've moved in. How sweet of the new occupant of your former home to hand deliver the mail to you. I would have been like you, and not made the connection at first. The lantern festival looks like wonderful fun, your photos are beautiful! Even more beautiful are the sweet memories you and John make together, this is the really good stuff of life, and it made me smile!